If you're in the New York Area don't miss the new wing at the Metropolitan Museum of Art featuring American history through art. The Metropolitan Museum's collection of American art, one of the finest and most comprehensive in the world, returned to view in expanded, reconceived, and dramatic new galleries on January 16, 2012, when the Museum inaugurated the New American Wing Galleries for Paintings, Sculpture, and Decorative Arts. The new installation provides visitors with a rich and captivating experience of the history of American art from the eighteenth through the early twentieth century. The suite of elegant new galleries encompasses 30,000 square feet for the display of the Museum's superb collection. The Museum's holdings are particularly rich in the works of the great masters, including John Singleton Copley (Daniel Crommelin Verplanck), Gilbert Stuart (George Washington), Thomas Cole (The Oxbow), Church (The Heart of the Andes), Winslow Homer (Prisoners from the Front), Thomas Eakins (Max Schmitt in a Single Scull), and John Singer Sargent (Madame X). The centerpiece of the new installation is one of the best-known works in all of American art, Emanuel Gottlieb Leutze's 1851 painting Washington Crossing the Delaware. This double-sized gallery showcases Leutze's iconic work alongside two other masterpieces—Church's Heart of the Andes and Albert Bierstadt's Rocky Mountains. The Museum's encyclopedic collection offers visitors the broad sweep of American history as told through great works of art. 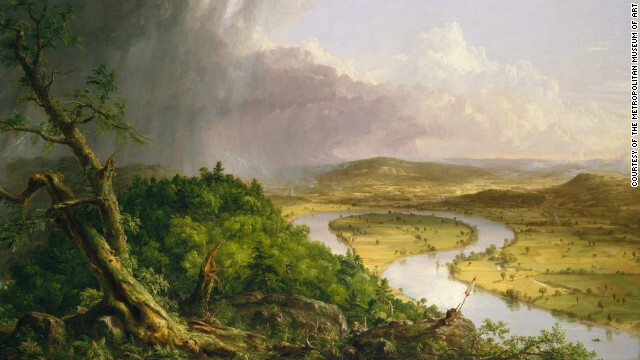 [US History themes in the art collection include] Colonial Portraiture, the American Revolution, the Young Republic, the Civil War Era, Art in the Folk Tradition, the Hudson River School, the West, the Cosmopolitan Spirit, and American Impressionism. Interspersed among the pictures is the American Wing's sculpture collection. Artists represented include Erastus Dow Palmer, John Quincy Adams Ward, Augustus Saint-Gaudens, Daniel Chester French, Frederic Remington, and Frederick William MacMonnies. The new suite of galleries also feature four rooms dedicated to the display of American decorative arts, principally treasures of colonial furniture and silver. Selected highlights of the Museum's extraordinary collection of early American silver include works by John Hull and Robert Sanderson, Myer Myers, and Paul Revere. The furniture gallery has masterpieces of late colonial case furniture by John Townsend of Newport and Thomas Affleck of Philadelphia, complemented by imposing architectural elements. In addition, the galleries include the grand pre-revolutionary entrance hall of the Van Rensselaer Manor House, Albany, New York. The opening of the New American Wing Galleries for Paintings, Sculpture, and Decorative Arts in January 2012 represents the third and final phase of a major, multi-part renovation project. Part 1 opened in January 2007 with galleries dedicated to the classical arts of America, 1810–1845. Part 2 opened in May 2009 with the renovation of The Charles Engelhard Court and the Period Rooms. Now that Part 3 is completed, nearly all of the American Wing's seventeen thousand works are on view.